Horse racing is extremely popular in the United States, with legal Triple Crown betting being the highlight of every horse enthusiast’s year. Will the Triple Crown be won this year? Can there be a repeat Triple Crown winner? These are the questions that every fan of the iconic races asks themselves come May. The Kentucky Derby, Preakness Stakes, and Belmont Stakes are each exciting to bet on in their own right, which is why online sportsbooks provide hundreds of Triple Crown betting odds for each leg of the journey. Betting the ponies online has become increasingly popular over the years because horse bettors are not limited to a particular track or betting venue. When you factor in the huge bonuses and free bets that you can get when using legal horse racing betting sites, it makes sense why so many horse fans are going the online route. Whether you are new to betting on horses or just want a quick refresher, you can find out everything you need to know about legal Triple Crown betting. Is It Legal To Bet On The Triple Crown In The United States? Triple Crown betting is legal in nearly all 50 states. Pari-mutuel wagering is widely accepted in the United States, even if the state you reside in does not have a live horse racing track. Online racebooks add more convenience and benefits than betting at a local track or OTB location. You can bet from your home computer or mobile phone, plus there are more competitive Triple Crown betting odds. As long as you use a reputable online racebook such as Bovada or SportsBetting, you will have no problem getting started with legal Triple Crown betting. What Types Of Bets Can I Place On The Triple Crown? If you have ever wagered at a local track, you will find that the same horse bets are available at online racebooks. There are certain bets, however, that are unique to horse racing betting sites. We will give you a refresher on legal Triple Crown betting types, plus go over what else you can find online. You have your Win, Place, and Show bets which are called straight bets. A Win bet is a wager on the horse that will finish first, a Place bet is on a horse to be in the top two, and a Show bet is on a horse to finish somewhere in the top three. If you bet “Across the Board”, you are combining all three bets. If your horse finishes first, you collect all three payoffs. If the horses comes in second, you collect the Place and Show payoffs. A third-place finish would receive the Show winnings. The Exacta, Trifecta, and Superfecta all fall into the exotic category. With these horse bets, you must wager on the exact order that the horses finish. With an Exacta, you bet on the horse to finish first and the horse to finish second. Perfecta bets are on the finishing order of the top three spots, while a Superfecta must be correct for the 1st, 2nd, 3rd, and 4th positions. Naturally, these exotics have much higher payouts. If you “box” your bet, you can then bet on all possible combinations with those horses rather than having to predict the exact order. Will Horse X Win The Belmont Stakes? Will Horse X Win The Triple Crown? Where Can I Legally Bet On The Triple Crown? You can legally bet on the Triple Crown at any US-friendly horse racing betting site. The best online racebooks are those that offer rebates, free bets, and other deposit bonuses. You should also be able to find Triple Crown betting odds that allow you to wager on the winner of the Crown, as well as the top horse in every race on the journey. Some of the best sites for legal Triple Crown betting are Bovada, BetOnline, and 5Dimes. Bovada Racebook is one of the top sites for legal Triple Crown betting. 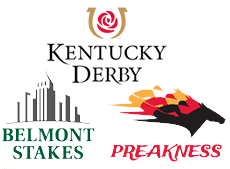 The site has Triple Crown betting odds for each crown in the jewel, meaning you can also bet on the Kentucky Derby, Preakness Stakes, and Belmont Stakes individually. Even better, Bovada offers a mobile racebook that allows you to bet the ponies anywhere, anytime. Just visit the Bovada website from your smartphone or tablet and you can access all of your standard account features. To get started at Bovada Racebook, just make a deposit with one of their reliable payment methods. Bitcoin is the most reliable, with a minimum of $10 and a maximum of $5,000. There are no fees, and your bitcoin racebook deposit will never get declined. You can also deposit up to $1,500 with a Visa or MasterCard, though there may be a small percentage fee charged by your card issuer. Both racebook deposit options are instant and you can start wagering on the Triple Crown the same day.